Kenya's Bukembe boys soccer team have bowed out of the East Africa School Games title contention after they were eliminated in the semi-finals today at Hill School Eldoret. Bukembe succumbed to 0-2 defeat by St.Mary's Kitende of Uganda in a hotly contested match. Despite exhibiting a good form throughout the match, Bukembe wasted a lot of scoring chances they created though the other side had a solid defense which proved hard to crack. Kitende drew first blood in the 22nd minute through Francis Omelat through combined efforts with Willy Ochen. In the 74th minute Ochen was on the mark doubling for his side with a lovely free header for a 2-0 victory as the final whistle went off. The two teams had met in the group matches drawing 1-1 but today Kitende were more powerful in all areas than the Kenyan side. Bungoma governor Kenneth Lusaka who had turned up to watch the match in support of the boys praised them for reaching semi-finals , "It is very impressive because you were fourth in the nationals and now you reached semi-final at East Africa Games.I am in full support of the team,"Lusaka said. In another semi final, Barding narrowly beat Kibuli SS of Uganda to advance to the finals.Denis Oduor scored the solitary goal in the 87th minute through a penalty. 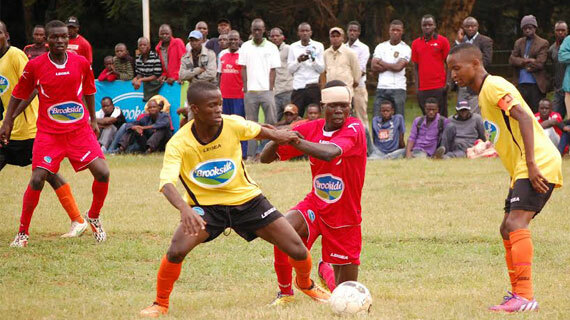 Bukembe will now face Kibuli in the playoffs as Kitende face Barding in the finals at Kipchoge Stadium.